Just when you thought Hollywood was done with questionable biker movies (Ghost Rider) along comes an oily jeans, bandana’s pulled real low over foreheads, tattooed up bad boyz, full of angst looking to intimidate or harass anyone within ear shot type film. It’s unlikely this one will change the street level viewpoint of outlaw biker “clubs” being solid, totally innocent, citizen and humanitarian’s of the world. 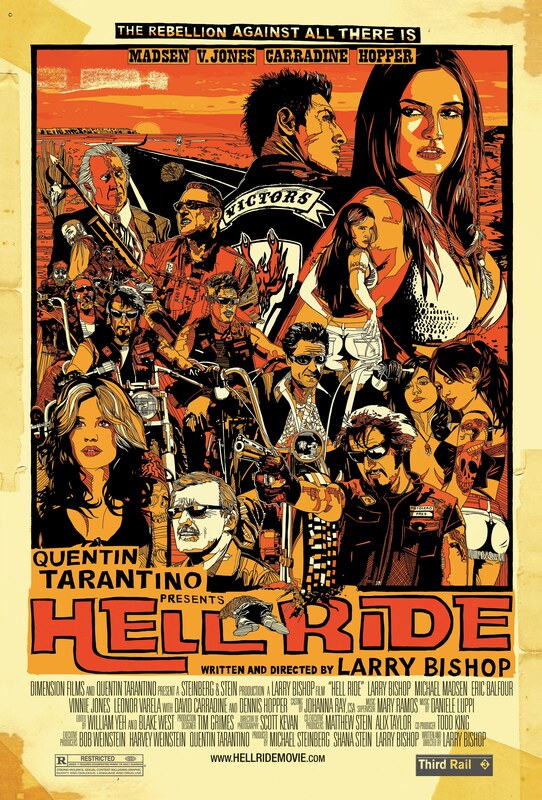 Rather it’s a mash-up of Kill Bill charters a motorcycle club as a “beat down” form of entertainment? The encounters in “Hell Ride” are like a sporting event from the Gladiator. Billed as a throwback to the Sergio Leone “spaghetti western” day with motorcycle revenge and retribution they leave out the fact that there might be some gore since Quentin Tarantino produced the film. Larry Bishop wrote and directed the story about this bunch of old guys in need of the “3-B’s” (bikes, babes, beer) riding around and along the way they shoot and knife a bunch of people. The only thing missing is Dylan’s recording of “It’s Alright, Ma (I’m Only Bleeding)”! You can preview the movie HERE. Lending star power credit as a real biker movie, Easy Rider legend Dennis “Scratch” Hopper stars as a rival member of the satanic biker gang. I guess he took a break from the “Dreams Don’t Retire” advertisements. Either that or his investment advice from Ameriprise Financial has him working for “scraps” as 60 is the new 35, right?! I do like Michael Madsen who starred in “Reservoir Dogs” and that was a well written movie. Hell Ride was released on the opening day of the Olympics and reviews suggests a very quick ship to DVD (without going Blu-Ray!). With all the issues and tensions in the U.S. on outlaw biker “clubs” it’s clear that Hollywood subscribes to the idea that “fiction is often the best fact”. Film poster courtesy Third Rail. Where: Paradise HD, Tigard Or. 411: Sign up 8-10am. $10 fee. I’ve done this poker run a couple of times previously and the Sunset HOG folks put on a nice poker run. The weather is typically great and the routes are awesome through the Oregon countryside. There is also something called a “Beaver Hunt” which means there will be signs on telephone polls, light posts etc., that will have a picture of a Beaver and a number on it. You add up all the numbers and turn in the grand total at the end of the poker run. Prizes will be given away. For the “hunt” its best to have a passenger…I came upon a biker who went right off the road last year. Not sure if they were trying to write a number down or what, but play it safe and let the passenger do the tally! 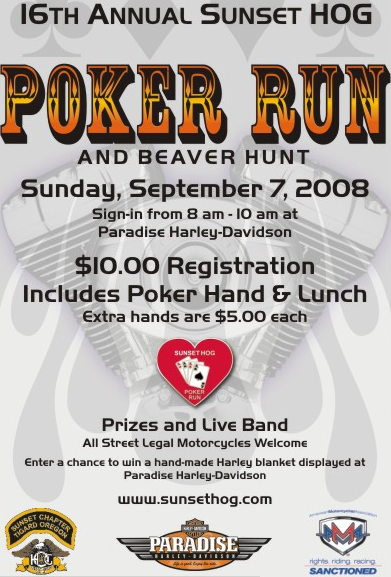 Poker Run poster photo courtsey Sunset HOG.